For 2015, the Beer Bloggers Conference was re-branded to be the Beer Bloggers and Writers Conference. We have always had non bloggers attend the conference, people who wrote about beer in magazines and wrote books about beer but more importantly, in the years that the conference has been running, many bloggers have gone on to also write books or get published in magazines and newspapers. The name change simply reflected the evolution of the humble beer blogger. Personally, I think the name is a little redundant. All bloggers are writers so the Beer Writers Conference would have been easier and to the point. I have written a separate overview of the conference that will appear on the Beer Bloggers Conference website so I won't do the same thing here. Instead, I wanted to mention a few things about the conference as it has become. I am one of only a handful of people who have attended all 5 conferences and that includes from the organisers camp so I think I am in an almost unique position to look back at them all. The first three years were in the UK and followed the same format. They were all a lot of fun and informative with the first one in London being the most memorable. How can one top walking the streets of London behind people in Victorian garb, while on stilts, laying down a bed of hops in our path? The main reason it was so memorable was simply because it was the first conference and the content was fresh while the bloggers were young. After this conference, some bloggers started to go pro and were less inclined to go the the following conference. The content sometimes was a little similar at times but since we usually had newbies, this was fine. I always learned something useful in at least one or two of the sessions. The fourth one was where I was directly involved in bringing it outside the UK to Dublin. Ireland is familiar territory for UK bloggers so they wouldn't be too far out of their comfort zone and there was something for everyone. The conference had needed to leave the UK in order to survive and Dublin was a natural stepping stone. Dublin was probably the smallest in terms of attendance but we still had about 60 or 70 people. This conference was more about the beer than content. A mini beer festival to open the conference at registration time. Most beer was served from keg and there was even a cask of oatmeal stout. There was something satisfying about walking about with a pint in your hand. Added to that, having fantastic weather and a massive beer garden at our disposal. Drinking Pilsner Urquell from a wooden cask while eating a BBQ feast in the sun was a particular highlight for me. It's rare to even have beer garden weather in Dublin. This showed the conference could survive after Ireland but it needed to get to mainland Europe to continue to thrive. Queue the announcement that it would be in Brussels. Awesome! I was ready to sign up there and then but when I read the agenda and saw how epic it was going to be, I was just in awe. To do everything would require the best part of a week. I flew in on Thursday and flew home on Tuesday. In terms of content, we were also back on track. Friday saw the return of live beer blogging, something that many (but not all) missed from the previous year. We were also treated to a press conference, something that was a first if I remember correctly. Saturday is always the main day of the conference and after a soft opening from WordPress, where they explained some fantastic improvements in the latest version of their free software, we then had an engaging and thought provoking, not to mention heated debate on beer marketing. This was just the thing to wake people up on a Saturday morning after a late night. Matt Curtis wrote in depth on that particular session so I suggest reading his article and enjoying his excellent images. After a fantastic beer and food pairing lunch, it was back to business. I hosted a talk with Bo Jensen of the EBCU representing the beer consumer (all of us) and Simon Spillane from Brewers of Europe, representing the industry. I can't comment on how the session went over but I hope it was at least somewhat interesting and enlightening. I put my foot in it when I paraphrased a colleague with breast cancer. She said that if she had a choice of which cancer she would get, this would be the one to go for. That provided some amusement to a few and probably facepalms from others. This was in relation to an article that scientists have said that one drink a day can increase the chances of breast cancer by 15% and the media translated that to alcohol causes cancer. I challenged those present to educate people on the many benefits of alcohol and beer in particular. The benefits outweigh the possible negatives when consumed responsibly. Everything in excess is bad for you, even water is toxic if too much is consumed and we need that to live. I particularly enjoyed the next session where 8 bloggers each gave a 5 minute report on themselves or their country. Wayne, the Irish Beer Snob did Ireland proud. Jeff told us all about biking around the world, including biking across Europe to get to the conference. Carol talked about Florida and the Baron and Chris talked about their beer reviews, especially they audio ones. Matt challenged us to think about the pictures that we use and try to tell a story with the picture. I'll admit that even though I'm an amateur photographer, my blog pictures are often not particularly interesting. Pedro told us about Brazil and Peter about San Diego. I would hope that this session will be repeated next year. Next we had some Petrus sour beers and were encouraged to make our own blend. It was a lot of fun and incredibly tasty too. I loved the Petrus labels, they were full of information but lacked ingredients? Since that's an EBCU issue and we had been talking about it earlier, I had to point it out on twitter. The conference ended and we were treated to dinner and respectable ABV beer from Pilsner Urquell with Thirsty Brewer: Vaclav Berka and his team. 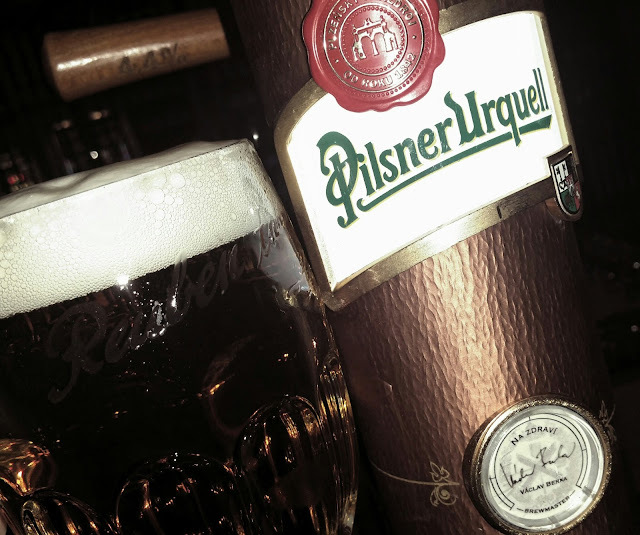 This year, they brought unpasteurised Pilsner Urquell in a tankovna. It was delicious and appreciated after so many strong Belgian beers. We even got or own personalised glasses engraved there and then. 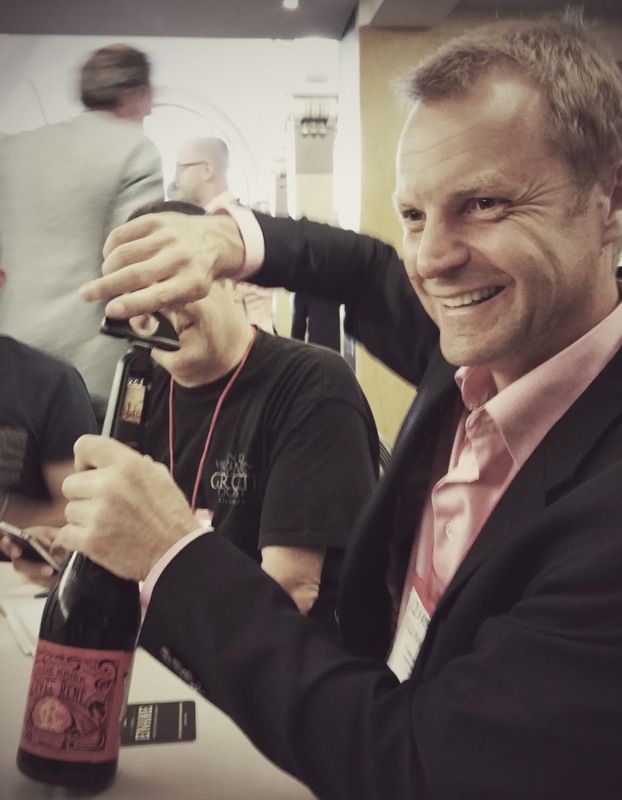 So that was the conference part of EBBC15 but what could have been changed to make it better? For the first time, we had a proper auditorium but this created an issue. Space was limited and when someone inevitably had to get up to use a restroom, everyone in the row needed to get up and move their equipment and glasses. Our usual tables and chairs system is less formal but works better so we should go back to that. Following on from Matt's 5 minutes on photography, I would like to see an entire session devoted to it with practical advice and even an exercise to be performed. A little friendly competition using our smartphones and twitter would be a lot of fun and would engage the attendees. Perhaps a session on podcasting would be fun and informative, in fact a live podcast during this session would be great! It could be a short podcast that is processed, uploaded and made live right there on stage. With a few years in a row of WordPress with similar content, perhaps a change on their end is warranted. Since their goal is to get people using other systems like Google's Blogger to transfer, perhaps they should hold a workshop demonstrating how to do just that. Migrate a dummy blog from blogger to WordPress live on screen. Those with laptops could possibly follow along and do the same thing as long as they have created a dummy blog on blogger in advance. That's assuming the migration can be completed in an hour of course. Really, any session that engages the audience is better than just being talked at with some questions at the end. Physical interaction is the best way of learning so anything that gets people doing things works brilliantly. There were rumours of Berlin next year. Prague has been rumoured for years too. We shall see as nothing official has been announced yet. The American conference will be in Tampa, Florida next year. A big thanks to Zephyr Adventures for organising things and to all of the sponsors for helping put it together. I'll be writing a separate article on some of the stuff we did outside the conference on the optional excursions. the announcement that it would be in Brussels. Awesome! OK, you can have two yellow cards. it was going to be, I was just in awe. To do everything would require the best part of a week. I flew in on Thursday and flew home on Tuesday. To be fair I've never been a fan of this kind of 'conference' - somewhere in the bowels of Dredge's site there's a squabble I had with Mark D before the first one about whether it should be called a conference at all. (I wouldn't say that I lost, exactly - more that he had no idea what I was going on about.) But I don't think I'm alone in tuning out of blog posts when I start getting this kind of impression. Hah, perhaps the American influences in my life has resulted in a vocabulary that conflicts with British stoicism. Interestingly, I'm an emotional stoic myself in person. I can help you with this though. Conference: a formal meeting of people with a shared interest, typically one that takes place over several days. That's what these are so yes, it is a conference. Great roundup as always Reuben, your efforts in assisting Zephyr are always appreciated by us fellow conference goers, so thanks! Cheers for the link back to my piece too. A great round-up of the conference, Reuben which nicely encapsulates the weekend’s proceedings. Although I’m a blogger, and a hobby one at that, I would be quite happy for future events to be branded simply as the Beer Writers Conference. It would be a lot easier on the tongue, for a start. This was my second conference; with last year in Dublin having been my first. Needless to say I thoroughly enjoyed both events and got a lot out of them. I also met a great bunch of people, and it was good to see people I’d met the previous year in Ireland, turning up again at this year’s conference. As you point out, there have been rumours of Berlin for next year, which would be good. Prague also seems to feature on the radar. However, much as I like the Czech capital, I’ve been there rather too many times for it to appeal to me as a conference venue. If Zephyr are reading these blog posts and comments, I think they should push the boat out and opt for Poland (Krakow) or Spain (Barcelona). Wherever the event ends up though, I look forward to seeing you and fellow Bloggers and writers at next year’s conference.